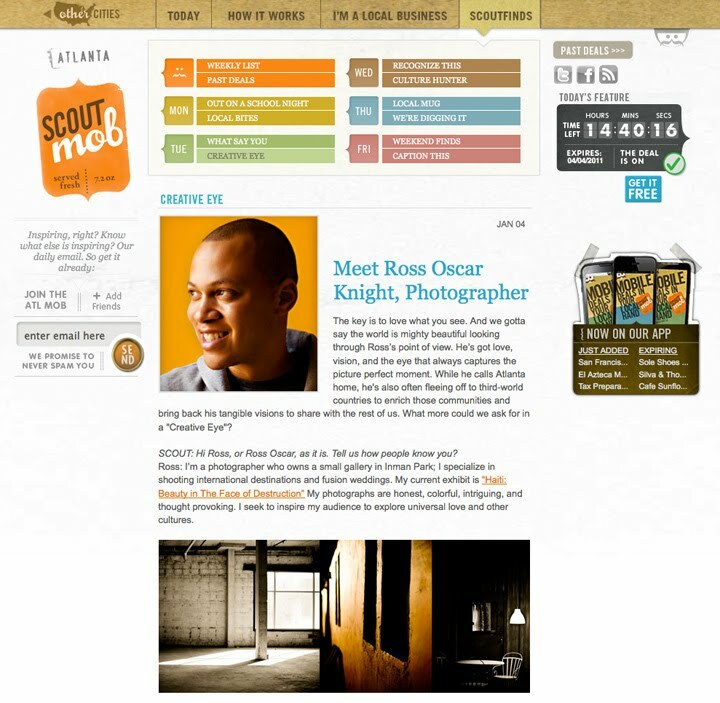 Here is a link to my full Creative Eye Interview with Scoutmob. Happy New Year! This is my first post of 2011 and we are off to a great start. I made my list of resolutions already and I’ll share some of them in my 4th Quarter check up post. I could barely sleep all of last night. I counted and I woke up 10 times. I even switched back and forth to two different beds and the couch. Finally I got up around 5 AM, walked my dog, ate a banana, and then headed off to work out near Grant Park. I made it to the office at 8 AM and I was pleasantly surprised to find an email in my from Scoutmob! If I have taken you out to eat in the last year or if you have asked me to give you some suggestions on what to do in Atlanta, then I have most definitely introduced you to Scoutmob. This website gives the best deals on the greatest restaurants in the city and keeps me up to date on whats new and happening in Atlanta. I’ve been following them since they were a neighborhood internet provider called Skyblox. Last year they re-branded as Scoutmob and expanded to different cities. I always said, "You da-man" Great article Ross. Happy New Year! always looking forward to your posts! thankful for your perspectives! be inspired and rejuvenated in this new year.